Story time tonight started with an old favourite. I like to go to something a bit more familiar when we've had a day out and a later return. There isn't anything more familiar to us than The Gruffalo . We've watched the film and read the book countless times. For those who don't know, it's a rhyming tale of a mouse taking a stroll through the wood and encountering creatures who want him to become part of their respective meal time. My voice of The Gruffalo is a cross between Jonathan Ross and Alan Sugar and my mouse is far more intelligent than James Corden ever sounds in the film (or anywhere else for that matter!). I think it's important that as a parent I can still find some way of getting something out of a book that is over familiar. I like trying to find new things within the pictures and illustrator Axel Scheffler is excellent with little details that often appear in several of his and writer Julia Donaldson's other books. There's a 2004 interview with Donaldson here where she explains its origins are very loosely based on an Eastern folk story where the mouse is a child and the Gruffalo is a tiger. If tiger was a better rhyming word the Gruffalo may never have existed! So, this afternoon we had an impromptu visit to the library. Manchester's Central Library's children's section is great, it doesn't have a pirate ship like Southport's but it is pretty awesome. 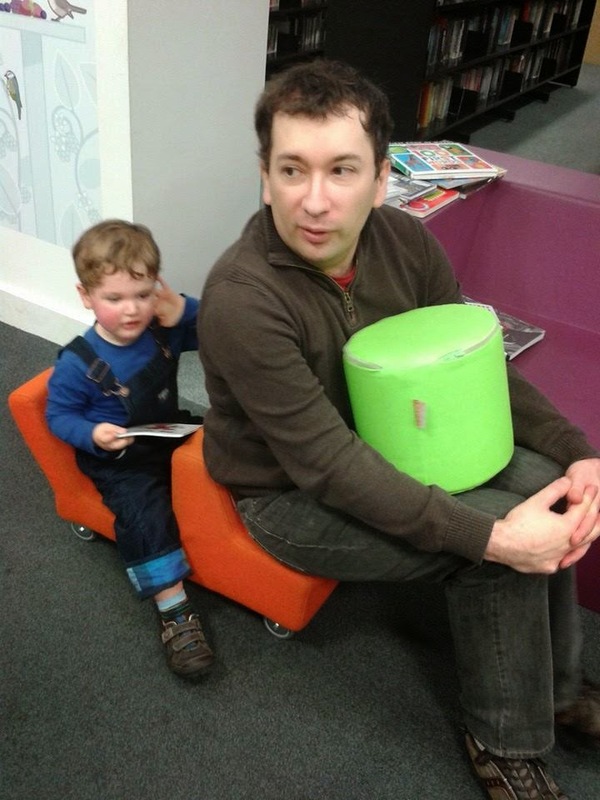 There's a great play area, and even little seats on wheels that some larger kids can sit on too! I am easily swayed by titles of books and/or the opening sentence, so The Mouse Who Ate the Moon by Petr Horacek won me on title alone. When I put the Amazon links in I check the pages and there's a quote from the Washington Post about Horacek that calls him "the thinking tot's Eric Carle". I'm sure I'll get round to Eric Carle soon enough but that is an apt description. This book is called a "peep through" book, it has bits carefully crafted out of several pages so we can peep through on to others. Linus really enjoyed this one, happily shouting out what exactly the piece of moon was and seeing what was ahead. I think Linus is just the right age for this one. We've read a couple of Horacek's books in the past but he hasn't ever hooked us quite as much as this did. The final book was chosen for its simplicity and calming nature. Charlotte Cooke has beautifully illustrated Margaret Wise Brown's Snowballs and Sunshine. It's essentially a short poem with a line or two on each page. It is a tale of changing seasons and weather. The pictures tell their own story of a little boy and girl through the seasons, so there's lots to see and talk about. The text also brings out my most literary story telling, Meg is wryly amused by my pronunciation of raked (to rhyme with naked).